Open 8:00 a.m. to dusk, except for permitted lighted activities. PLEASE NOTE: THE PLAYING FIELDS ARE CURRENTLY CLOSED EXCEPT FOR SCHEDULED EVENTS. PLEASE RESPECT THE CLOSURES, AND ALLOW THE TURF TO REGENERATE. THANKS FOR YOUR COOPERATION. Frances Ryan Park contains 67 acres, 42 of which are currently developed. Phase one of the park's construction consisted of: seven athletic fields, five with lights and two without; parking; and landscaping. 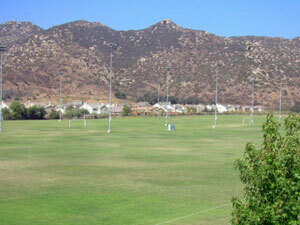 The fields are currently home to the Escondido Youth Soccer Club, and are used by many other non-profit groups and citizens. Phase two of the park's construction consisted of restrooms and concession facilities. Future phases will include: additional paved parking; two Little League baseball fields with lights; another unlit practice area; a second restroom/concession building; and a playground area. The land was purchased by the City and named after Frances Ryan, a former teacher at Escondido High School and one of the first persons to collect information and publish books on the history of Escondido. A number of years ago, Frances left her collection to the Library and established a trust fund which is used to operate the Pioneer Room. The Ryan family lived just east of the park, and was responsible for planting many large oak specimens throughout the east end of the valley. The Engelmann Oak, one of the most endangered oak species in California, can be found among the trees planted by the Ryan family in the east end of the park. In fact, Mayflower Dog Park is named for the Mayflower Tree, an Engelmann Oak planted by Frances Ryan just west of Dog Park. As the story goes, Frances obtained an acorn from a tree planted by the pilgrims who arrived on the Mayflower. NOTE: Dogs are not permitted at Ryan Park. Please do not bring your dog to your children's soccer games or tournaments. Thanks you for your cooperation!